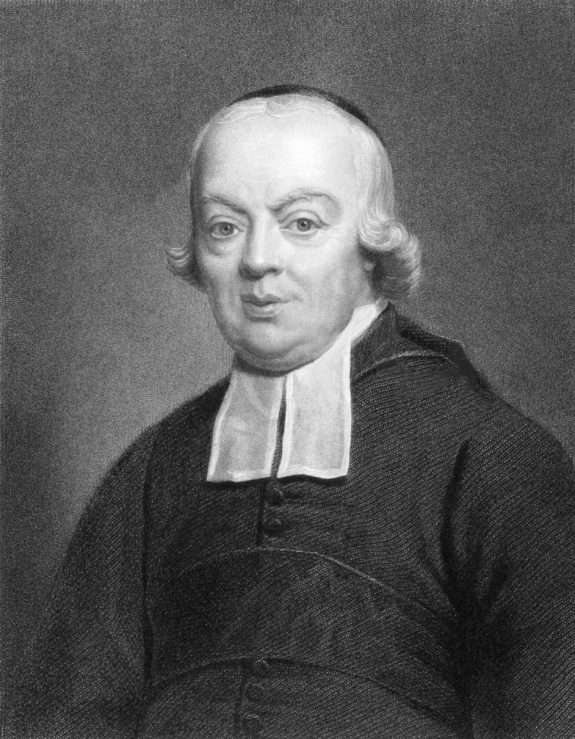 While not a resident of the Philadelphia area, Abbé Charles-Michel de l’Epée (1712–89) was a pioneer in the education of hearing impaired. In 1760, he opened the National Deaf-Mute Institute in Paris, the world’s first public deaf school. 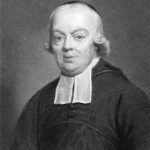 Abbé de l’Epée was instrumental in the creation of public education of the deaf on a global scale as his teaching methods were made public. Educators from around the globe flocked to Abbé de l’Epée’s institute to learn how to communicate and educate the hearing impaired. One of those inspired by the work of Abbé de l’Epée’s was David Seixas (1788–1864), the founder of the Pennsylvania School for the Deaf. 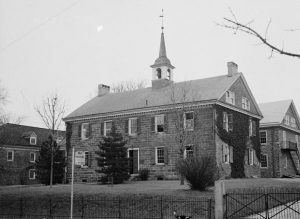 Since 1984, the Pennsylvania School for the Deaf has occupied the Old Germantown Academy. 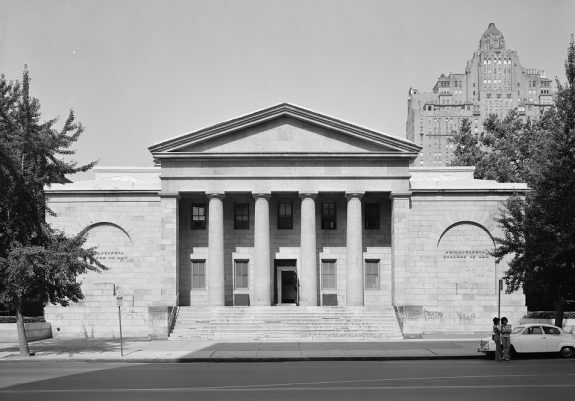 Originally operated by the academy, the site was opened in 1795 and continually expanded for two centuries before the academy relocated in 1965. In the twenty-first century, the Pennsylvania School for the Deaf continued to educate the hearing-impaired children of the Philadelphia region. In the early nineteenth century, Philadelphia businessman and philanthropist David Seixas began educating deaf children in his home. The project quickly outgrew the private residence. 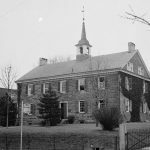 In 1821, Seixas opened the Pennsylvania Institution for the Deaf and Dumb. The institution was chartered by the Pennsylvania Commonwealth Assembly as a school “…where the children of the rich, for a moderate compensation, and of the poor, gratuitously, laboring under the privation of the faculty of speech, are maintained and educated." The school continued to expand throughout the nineteenth century and in 1892, the campus moved to Mount Airy. The original building (shown here) was preserved for its architecture, later purchased by the University of the Arts, and added to the National Register of Historic Places in May 1985. 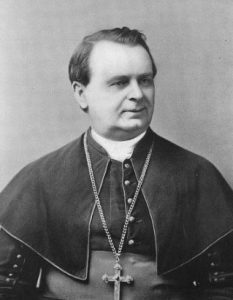 Patrick Ryan served as the Archbishop of Philadelphia from 1884 to 1911 and furthered the education of the hearing impaired in the city. Concerned with the plight of his deaf parishioners, Ryan worked to establish formal education for the deaf children of the city. In May 1912, the Archbishop Ryan Memorial Institute for the Deaf and Dumb opened on Vine Street, named in tribute to the former archbishop. In 1996, Archbishop Ryan School for the Deaf relocated to Delaware County. Documentation of the lives of deaf individuals in the Philadelphia region, and elsewhere, is limited. Historic accounts depict desperate individuals roaming the streets or begging. Prior to the advent of public schools for the deaf, only elite deaf individuals received private tutoring. In the early nineteenth century, Philadelphia philanthropists, religious figures, educators, merchants, and policymakers came together and created the city’s first school for the deaf. Their successes inspired other advocates to expand deaf education and services. Though later educators judged some of their efforts misguided, these pioneers demonstrated that the region’s impoverished deaf residents could also become productive citizens. During the colonial era, only elite deaf children received much education, and it typically took the form of private instruction or tutoring. William Mercer (1765?–1839? ), who was congenitally deaf, studied under the distinguished Philadelphia artist Charles Willson Peale (1741–1827) after his father was killed in the Battle of Princeton. Peale and his wife, Rachel (1744–70), welcomed Mercer into their family of ten children from 1783 until 1786. Mercer was one of the first congenitally deaf individuals in the United States to become a distinguished artist. 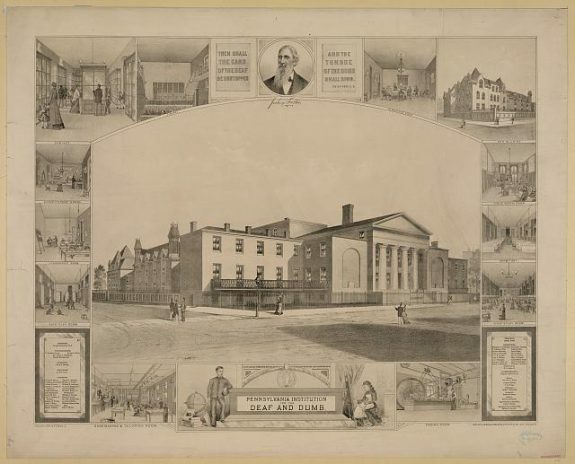 The Pennsylvania School for the Deaf in Philadelphia (formerly known as the Pennsylvania Institution for the Deaf and Dumb), the third-oldest school of its kind in the United States, was one of many that emerged in the early nineteenth century following the advent of deaf education in Europe. Public education for the deaf originated in France in the 1760s when Jansenist priest Abbé Charles-Michel de l’Epée (1712–89) created the National Deaf-Mute Institute in Paris, the world’s first public deaf school. His work eventually inspired deaf education programs in other nations, including the Pennsylvania School for the Deaf which began when David Seixas (1788–1864), a Philadelphia merchant and crockery owner, began to educate and provide room and board to a small group of local indigent deaf children. Moved by his concern for impoverished children whom he regularly witnessed roaming city streets, Seixas brought eleven poor deaf children into his home, where he fed, clothed, and educated them. Among the first group of children were future artists John Carlin (1813–91) and Albert Newsam (1809–64). Carlin, who became deaf as a young child, later studied portraiture in France under esteemed artist Paul Delaroche (1797–1856). He spent his adult life working as an artist and poet in New York, where he served as an activist for the deaf. Newsam, brought to Philadelphia from Steubenville, Ohio, in 1820 by William P. Davis, who allegedly convinced Newsam’s guardian to allow him to take the child to Philadelphia and intended to exploit the young boy’s artistic talent for his own gain, entered the school at age eleven after local Episcopal Bishop William White (1784­–1836) found him on the streets and took him to Seixas’s home. There he received an education and developed his artistic talent. Newsam apprenticed with the local engraving firm of Cephas G. Childs (1793–1871) and eventually became a principal artist at the firm of Peter S. Duval (1805?–86). Bishop White became intrigued by Seixas’s dedication to these poor deaf children and called for members of the American Philosophical Society to create a more permanent establishment. In May 1820, members of the society petitioned the Pennsylvania state legislature to officially recognize Seixas’s school, which it did in 1821. 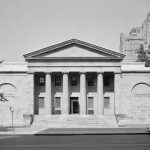 With the support of growing community interest and both philanthropic and state-sponsored funding, the institute officially opened at the corner of Eleventh and Market Streets in Philadelphia in the autumn of 1820 with Seixas as the institute’s first principal. Soon nearby states, including New Jersey, Maryland, and Delaware, began sending their indigent deaf children there. Seixas was later dismissed from his post for alleged sexual misconduct with several female students. The Pennsylvania School for the Deaf eventually appointed Abraham B. Hutton (1798–1870) principal in 1830, and he remained in that position until his death. Pedagogical shifts that focused on oralism, or training in the reading of lips, affected Philadelphia’s deaf community. Early efforts to instruct the deaf typically relied on the manual method, or sign language. In the 1870s, deaf education experienced a significant transformation as more programs began adopting the oral method. Educators throughout Europe and North America embraced oralism as the progressive approach to “normalize” the deaf and incorporate them into mainstream society. In the late nineteenth century, sisters Emma (1846–93) and Mary Garrett (1854–1915) expanded services for the deaf in the region. Emma Garrett attended the program for teachers of the deaf at Boston University run by Alexander Graham Bell (1847–1922), whose curriculum focused primarily on the oral method and on how to teach the deaf how to communicate and “behave” when interacting with the hearing community. After completing her education, Emma became a teacher at the Pennsylvania School for the Deaf and later served as principal of the Pennsylvania Oral School for Deaf-Mutes in Scranton. Like many deaf-education professionals of this period, she visited several countries to observe their teaching methods. Her observations of oralist methods, coupled with the widespread assumption that children (and especially deaf children) are incredibly imitative, led the sisters to establish an early intervention program in 1892. The Garretts established the Pennsylvania Home for the Training in Speech of Deaf Children Before They Are of School Age (also known as the Bala Home) at Belmont and Monument Avenues in Philadelphia. The school adopted a strict interventionist method that introduced the oral method at an early age. Emma served as superintendent of the institute until her death in 1893, when Mary assumed the post. Mary became a pioneer in the oral communication method as well as an advocate for the education of young women. She trained other notable educators of the deaf, including Margaret S. Sterck (1892–1984), who established the Delaware School for the Deaf in 1929, which remained active until 1945, when state regulations required that deaf children be taught in public schools. After visiting oralist schools in other states, educators at the Pennsylvania School for the Deaf also shifted their program to include more training in the oral method. This decision reflected a broader international push for the method that had been adopted years earlier at the Milan Congress of 1880, where hearing delegates determined that sign language was a cumbersome form of communication and that the deaf should be taught to communicate in a “normal” way. In the decades following the Milan Congress, nineteenth-century pioneer in science Alexander Graham Bell (1847–1922) advocated that schools throughout the United States and Europe adopt oralism, viewed as the progressive approach to “normalize” the deaf and incorporate them into mainstream society. The Pennsylvania School for the Deaf became one of the largest schools for the deaf in the United States. The widespread teaching of oralism later sparked controversy because it eventually led to the near elimination of sign language and disenfranchisement of the deaf community. New advocacy groups such as the Pennsylvania Society for the Advancement of the Deaf, created in Philadelphia in 1881, also pushed to incorporate deaf individuals into society and maximize their potential. It was joined in the early twentieth century by such organizations as the Philadelphia League for the Hard of Hearing and the Speech-Reading Club of Philadelphia. Religious leaders contributed to helping local deaf populations as well. 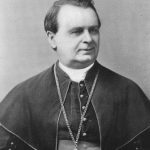 Concerned for his deaf parishioners, Archbishop Patrick Ryan (1831–1911) envisioned an institute that would serve the needs of deaf Catholics. While not realized until the year after his death, the Archbishop Ryan Memorial Institute for the Deaf, established first on Vine Street and then later moved to Thirty-Fifth and Spring Garden Streets and eventually to Delaware County, was named in his honor. After nearly a century during which the oral method dominated, the study of sign language resurged in the late 1960s. After passage of the Individuals with Disabilities Education Act in the 1970s, deaf schools nationwide employed a variety of educational methods. These approaches ranged from bicultural/bilingual education, in which American Sign Language is taught as a first language and written (or spoken) English is taught as a second language, to auditory-oral and auditory-verbal education. In the mid-1980s, Philadelphia schools adopted the more recent “mainstreaming” or inclusion model, in which deaf children attended public school for part of the school day while also receiving individualized deaf instruction. Programs such as the Clarke Schools for Hearing and Speech (located in Philadelphia and Bryn Mawr) later incorporated the “mainstreaming” model into their day school program. Critics argued that although this model provided inclusion and daily interaction with hearing individuals, deaf children found themselves isolated from other deaf individuals and received limited individualized support for special education needs. Baynton, Douglas C. Forbidden Signs: American Culture and the Campaign against Sign Language. Chicago: University of Chicago Press, 1996. Birch, Susan. Signs of Resistance: American Deaf Cultural History, 1900 to World War II. New York: New York University Press, 2002. Branson, Jan and Don Miller. Damned for Their Difference: The Cultural Construction of Deaf People as “Disabled.” Washington, DC: Gallaudet University Press, 2002. Davis, Lennard J. Enforcing Normalcy: Disability, Deafness, and the Body. London, New York: Verso, 1995. Edwards, R. A. R. Words Made Flesh: Nineteenth-century Deaf Education and the Growth of Deaf Culture. New York: New York University Press, 2012. Edwards, Steven D. Disability: Definitions, Value, and Identity. Oxford: Radcliffe Publishing, 2005. Greenwald, Brian H. “The Real ‘Toll’ of A. G. Bell: Lessons about Eugenics.” Sign Language Studies 9:3 (Spring 2009): 258–65. Kennedy, Emmet. Abbé Sicard’s Deaf Education: Empowering the Mute, 1785–1820. New York: Palgrave Macmillan, 2015. Lang, Harry and Bonnie Meath-Lang. Deaf Persons in the Arts and Sciences: A Biographical Dictionary. Santa Barbara, Calif.: Greenwood Publishing Group, 1995. Padden, Carol and Tom Humphries. Inside Deaf Culture. Cambridge, MA: Harvard University Press, 2005. Sonnenstrahl, Deborah M. Deaf Artists in America: Colonial to Contemporary. San Diego, Calif.: Dawn Sign Press, 2003. Van Cleave, John Vickrey. The Deaf History Reader. Washington, DC: Gallaudet University Press, 2007. Broadside Collection 1638-1980 and Eugenics Record Office Records, American Philosophical Society, 104 S. Fifth Street, Philadelphia. Walter Hughson Papers 1921-1945, Historical Medical Library of the College of Physicians, 19 S. Twenty-Second Street, Philadelphia. Disability History Museum (Digital Archive). Deaf Rare Materials, and Deaf Mutes’ Journal, Gallaudet University Library and Archives (Digital Archive). 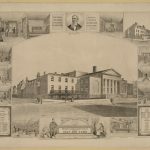 Philadelphia Lithographers: Albert Newsam (1809-1864), Kislak Center for Special Collections, Rare Books, and Manuscripts, Van Pelt-Deitrich Library Center, University of Pennsylvania, 3420 Walnut Street, Philadelphia. Clarke Schools for Hearing and Speech, Bryn Mawr Campus, 455 S. Roberts Road, Bryn Mawr, Pa.
Clarke Schools for Hearing and Speech, Philadelphia Campus, 2 Penn Boulevard, Suite 220, Philadelphia. Delaware School for the Deaf, 630 E. Chestnut Hill Road, Newark, Del. Maryland School for the Deaf, 101 Clarke Place, Frederick, Md. Pennsylvania School for the Deaf, 100 W. School House Lane, Philadelphia.